This rhinestone banding is the real thing! Real individually set rhinestones make this ribbon sparkle. 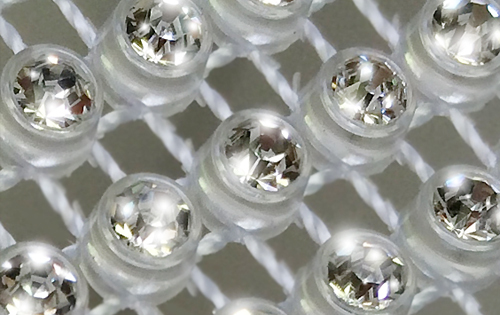 Our stunning rhinestone banding is made up of rows of rhinestone bling which is a perfect decoration as a cake ribbon, wedding cake banding, create rhinestone wrapped candles or cake decoration for your wedding cake, anniversary cake, clothing and accessories! 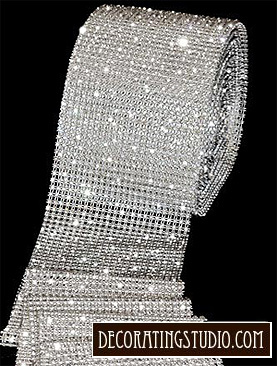 This is a high quality rhinestone trim with rows and rows of individually set crystal rhinestones on a semi-transparent mesh flexible banding. Just to give you an idea of how many sparkling rhinestones are on this banding, 1 yard of the 24 row wide banding has 3,888 individually set rhinestones! 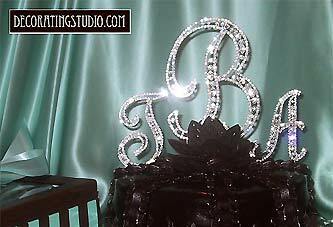 Our rhinestone banding can be used for many different projects - not just for decorating wedding cakes. Add a bit of bling to a pair of jeans, a handbag, shoes or just about on anything! This banding is made of real crystals! 1 yard of the 4 row wide banding has 648 individually set rhinestones! 1 yard of the 6 row wide banding has 972 individually set rhinestones! 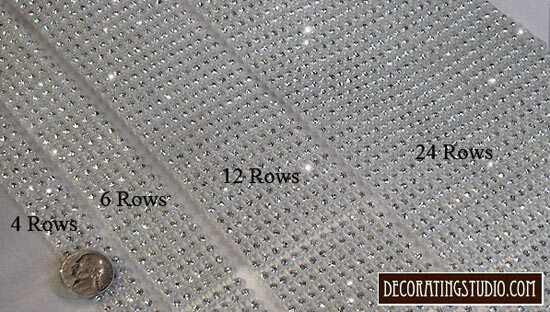 1 yard of the 12 row wide banding has 1,944 individually set rhinestones! 1 yard of the 24 row wide banding has 3,888 individually set rhinestones in it! This rhinestone trim is sold in continuous yards. (Example: If you order 2 yards, you will receive a full uncut 2 yard length). A bolt of this trim is 10 yards long, so maximum uncut length is 10 yards. 12 yards would be a 10 yard length and a 2 yard length. This item is not returnable. We suggest that you order a free sample to view before ordering yardage. We also have matching Rhinestone Table Runners! If you are decorating your own cake, we suggest that you gently hand wash the rhinestone mesh in cold water using a small amount of liquid dishwashing detergent. Then rinse well in cold water. Remember to use only cold water when washing and rinsing. Then lay out flat to air dry - Do not use heat to dry. Cut a strip of wax paper or parchment paper the length and width of the banding to go around each tier. Apply a tiny thin line of non-toxic clear craft glue along the top and bottom edge of the strip of wax paper, then lay the rhinestone banding on top rhinestone side up, of course!). You want to glue the backside of the rhinestone banding to the wax paper. 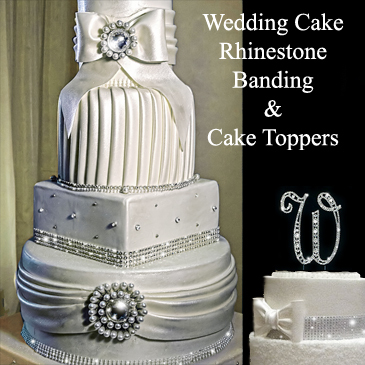 Allow the rhinestone ribbon banding to dry to the paper - then the rhinestone ribbon strip is ready to apply to the surface of the cake tiers without the risk of the icing coming through the mesh and covering any of the rhinestones. This rhinestone banding is an incredibly beautiful and elegant way to add unique bling to your anniversary, birthday or wedding cake. will know how they want to apply it to the cake. In order to determine the circumference (around) the round tier for the rhinestone ribbon/banding, you take the diameter of the tier and multiply x 3.14. The following would be the amount you would need of the ribbon banding to go around each size cake tier. We recommend (and have added below) that you get a little extra; anywhere from 1 to 3 more than the exact circumference. This will give you a little extra to work with, depending on the thickness of the icing or any other decorations. Elegant Bling for your Wedding Cake, Birthday Cake or Anniversary Cake!